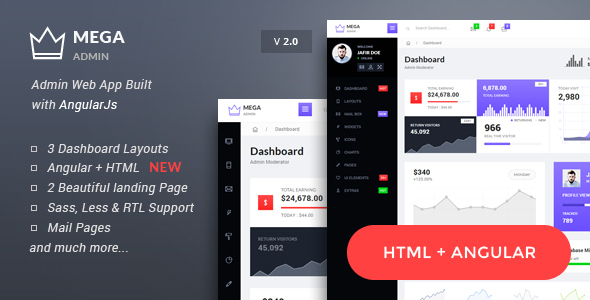 Mega – Bootstrap Admin Web App with AngularJs Powered Created by themenum. This templates have specific characteristics, namely: Mega has features such as High Resolution: Yes, Compatible Browsers: IE9, IE10, IE11, Firefox, Safari, Opera, Chrome, Compatible With: AngularJS, Bootstrap 3.x, Columns: 3 . You can use this Mega – Bootstrap Admin Web App with AngularJs Powered on Site templates category for admin, admin dashboard, angular admin, bootstrap admin, dashboard, modern admin, responsive admin, web admin, web app and another uses.